Read the book that spawned the notorious blog, restaurant industry forum, webisodes, a sequel, and haterz like you wouldn’t believe. PX This. (Diary of the “Maître d’ to the Stars”) – The Revised Edition, is the witty, irreverent (star-studded) four-year journal of a struggling commercial-artist/fashion-designer moonlighting as a maître d’ at some of Manhattan’s most renowned restaurants. It is a lighthearted, humorous, poignant, and uniquely insightful romp through the nightly playgrounds of some of New York’s (and Hollywood’s) most glamorous and elite, as viewed from the front podium. You’ll laugh! You’ll cry! It’s "the bible of the [NYC Food & Beverage fine dining] industry!" 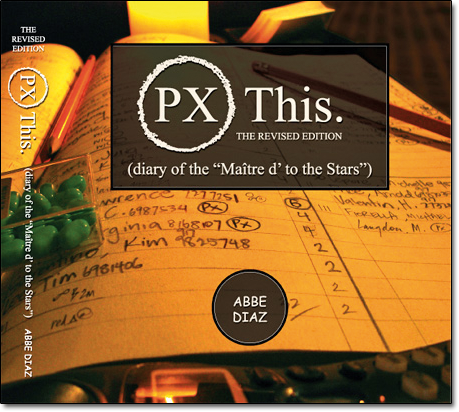 PX This has been lauded as “the bible of the [NYC] industry,” and its best-selling author, Abbe Diaz, has been featured in various media outlets such as The New York Daily News, The New York Post, msn.com, BBC.com, The Morning Show (Australia), CBS’s The Insider, The New York Observer, Blackbook, Time Out New York, Perez Hilton, Gawker, LXTV-NBC, NBC Chicago, New York magazine, Mediabistro, hamptons.com, and foodchannel.com, just to name a few.